Following my research into anxiety and tableau I created some images which I felt sum up my main triggers in terms of my own anxiety disorder, I feel the images are very good, if not a little frightening. However I think to take away from the chronological narrative of the screen based piece, while usually an effective narrative form it is not so effective here as this makes the video feel simply like a short horror movie with little plot or reason. I think in future endeavours I can take more images that are the ‘untriggered’ version of these e.g. a sink with plain water instead of ‘blood’. This can allow the viewer to see the way I as the sufferer see the world as opposed to how they ‘the normal’ see it. Also, such as the works by Katie Crawford in My Anxious Heart, I can consider using captions and text to further the meaning of my screen based narrative. Following the first video I created I wanted it to look like more of an event, after talking to some of my peers, some of whom had not realised I suffered from anxiety I decided to show this feeling. When I am in a crowd (to me it is a crowd, in reality a small group) of people, I feel at the height of panic, I feel like everyone is on fire and I am just there all calm on the outside with no real reaction whereas inside I feel like running. 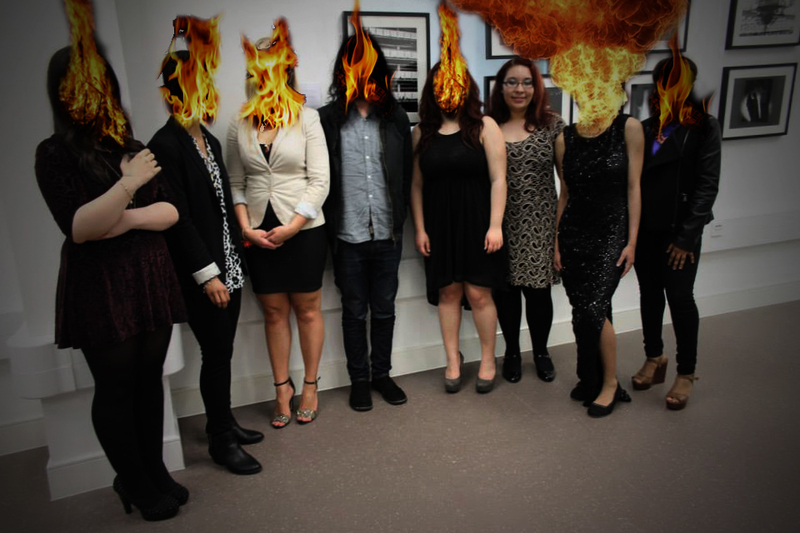 To demonstrate this I used a group photo of classmates from a graduation exhibition where I appear smiling and happy beside friends and acquaintances I knew for two years, as this event in particular reminds me of how strongly I felt my anxiety even though I felt more comfortable with them. e.g. If even best friends are on fire, what are strangers in my mind? 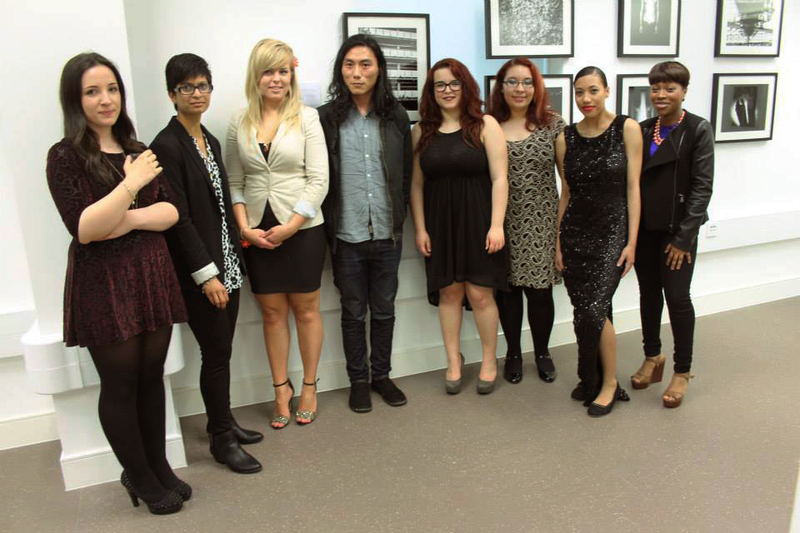 How I felt while posing for this ‘Proof’ exhibition group photo. As is noticeable in the above images, I took my own emotional response into how dark and cold the ‘after’ image appears. Using photoshop I added a darker vignette and blue-y tones as well as obviously fire [provided from stock images here]I feel this gives the images a smoky sort of tone perhaps as if the whole world is on fire and no one notices the difference. I quite liked how the before and after quality of this image shocks the viewer, upon showing this to the person who stands beside me in this photo [right], she descended first into giggles and then mentioned that to other people it could look quite worrying, which is perfect as this is exactly what I had hoped for. I used this particular music to be calming, even throughout the more scary images as I felt this shows how I feel on the surface, as a battle with myself and my mind, with a calm exterior but wanting to run away as fast as I can from whatever has triggered me. The music used is Aria De Capo, from Bach’s Goldberg Variations, I chose this piece in particular as it has become known due to it’s use in NBC’s Hannibal TV Show, the main character Hannibal Lecter, a vicious socio-path who then eats his victims! Often Hannibal plays the piece on piano during episodes, the music is often used to accompany foreshadowing and foreboding events as well as some of the murders themselves. Leading to the juxtaposition between calm music/surface and tense reality. Looking back at the second screen based experiment I think I definitely improved on the first experiment, it seems more like a story, there is a stronger sense of an event occurring with the addition of the group photo, this adds a more personal element to the final video. However I think that the video is maybe too calm, and as I experience the anxiety I know I do not truly feel calm and perhaps I need to add more suspense to the story. One way I could do this would be to fragment the narrative, perhaps by changing the order of the sequence, I think I could also change the music into something more suspenseful, but still with the happy/calm overtone that the Aria de Capo had.